Throughout history, business has been one of the most effective tools to drive social and economic growth. Look no further than the United States for proof: Thanks to our early adaptation and focus on capitalism, GDP continues to double China's. Unfortunately with all this focused capital, talent, and energy on making higher profits, many important issues have been neglected and created a trap for the record-high 43 million people in the U.S. currently living in poverty, or, 14 percent of our population. Job Discrimination: Who's Responsibility Are The Underemployed? Often issues like unemployment and access to healthcare are left for nonprofits and government agencies to deal with. But nonprofits remain commonly underfunded and reliant on other's spare cash, have failure rates in the high 90th percentile. For government agencies, bandaging corruption and bureaucratic hang-ups become a higher priority than any real progress. While nonprofits have had decent progress and play an important role in connecting business with their social stakeholders, mega-issues remain unsolved across the country. Thus, social enterprise, i.e., a businesses that prioritize a social mission over their financial bottom line, have proven to be great alternatives to solve the same issues that nonprofits and governments have failed to resolve for years. These businesses focus on making profit only to be sustainable and operational growth. The reason for that is obvious: The longer they are in business, the wider their impact can be. MoJo, short for Moms and Jobs, is one of a growing number of businesses with a social enterprise mission focused on the U.S. An apparel company based out of Lowell, Mass., MoJo might seem like any other clothing line at first glance. But what separates MoJo from its peers is its business model: Connecting the underemployed, specifically single mothers, with meaningful careers. In an economy when it's easy to ignore this population for other more-pressing issues like job creation for the educated, fighting a growing deficit and battling out the perfect health care plan, MoJo is filling a big gap by targeting this crucial economic sector. Many people call MoJo a high-impact social enterprise because it brings single moms and their children out of poverty through new careers with strategic benefits. 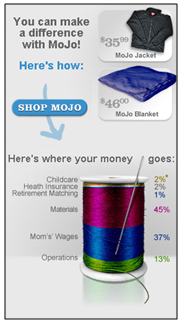 MoJo employs low-income single moms and provides them with new skills training, above-minimum wage pay, and benefits such as free childcare. Why a singular focus on single mom? The team at MoJo believes that empowering more women by helping them build long-term careers is a guaranteed pathway out of poverty. But MoJo is just one example of how a social enterprise can have huge impact. You don't have to look too far to find others: Tom's Shoes, Kiva, and Grameen Bank are just three examples of emerging businesses that emphasize a social mission. What distinguishes these organizations is the huge—and measurable—impact they have had by acting on a resolute belief that social issues are indeed their responsibility. Just imagine where the world would be if more people started sharing this responsibility. Thanks to my eye-opening undergraduate internship—which compelled me to change career tracks, today I work for a company that align my education and skills with a job that is meaningful, lucrative, and satisfying.